Hubert de Givenchy (b.1927) launched his collection in 1952, and was one of the youngest couturiers working in Paris at that time. His designs bridged the old world of haute couture and the new mood in fashion that emerged in the late 1950s, and which was moving towards the youthful and paired down lines of the 1960s. A disciple of Cristóbal Balenciaga (1895-1972), Givenchy was inspired by his architectural approach to fashion. Givenchy still refers to Balenciaga as 'the master'. This evening dress was designed with shoes of matching green silk. Evening dress and matching shoes. 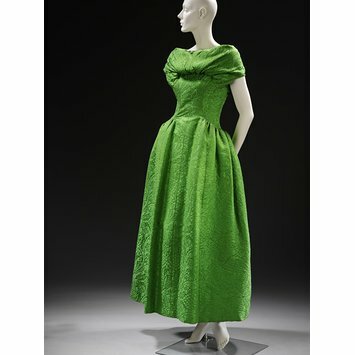 Emerald green satin matelasse brocade. The dress is ankle length, with a fitted bodice, Princess line panel down the front, and slightly dropped waist at the hips, skirt full at hips and flat in front. Draped cowl neckline and short sleeves. Shoes are high heeled pumps covered in matching silk. In 1954, Christian Dior (1905-57) launched his 'H-line' collection. It took as its inspiration the flattened bust and dropped waist of the Tudor/Renaissance style, and even sometimes emulated the rich brocades and embroidery of the period. This dress is reminiscent of that particular style, and may have been inspired by it. 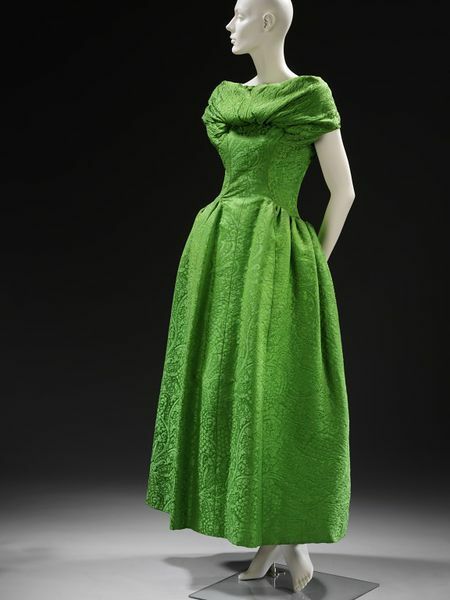 Evening dress and shoes in silk matelasse brocade, designed by Givenchy, Paris, ca. 1955. Givenchy was one of the younger generation of couturiers. His designs bridged the old world of haute couture and the new mood in fashion that emerged in the late 1950s. A disciple of Balenciaga, he was inspired by the master's architectural approach to fashion.